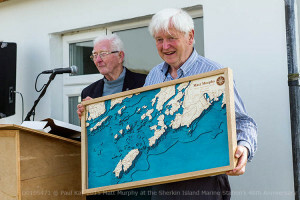 The Sherkin Island Marine Station is on the island which lies off Baltimore on the County Cork coast in Ireland. This year it has just celebrated its 40th anniversary. 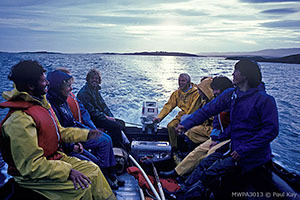 I was a volunteer at the Marine Station from 1982 to 1984 and these were very formative years. They sparked my life-long interest in the marine environment. 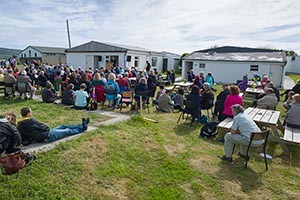 On the 22nd, 23rd and 24th May this year (2015) Matt Murphy, director of the station, himself now 80, celebrated its 40th anniversary with a celebratory, long weekend, and over 300 people converged on the tiny island off the coast of County Cork in Ireland. Travel distance had obviously not deterred people and attendees came not only from Ireland, but from the UK, Belgium, Norway, Africa, USA, Canada, Thailand and probably many more. It was an extraordinary day with glorious, hot weather and the station looked great, freshly painted and with new displays for all to see. Matt was himself amazed at the turnout, and received his well-deserved accolades with delight as well as several unexpected presentations including one from a US department.